Beans had a friend over the other day and they were playing in the backyard. 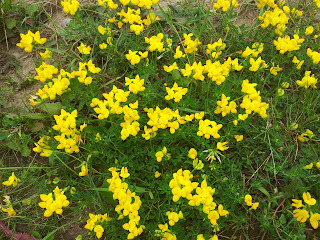 They decided to pick some flowers and her friend brought a pretty little yellow one over to me. 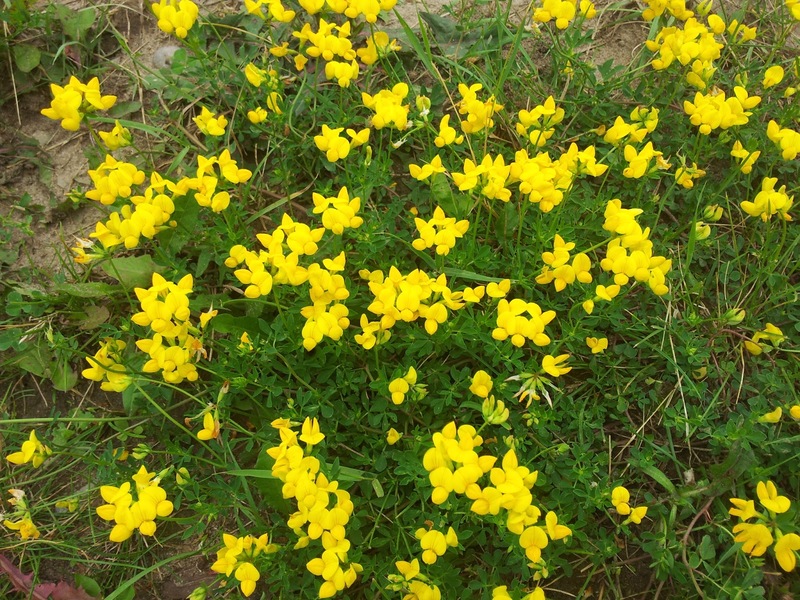 I explained that it was "birdsfoot trefoil" and she responded by telling Beans that she was lucky, her yard just had grass. 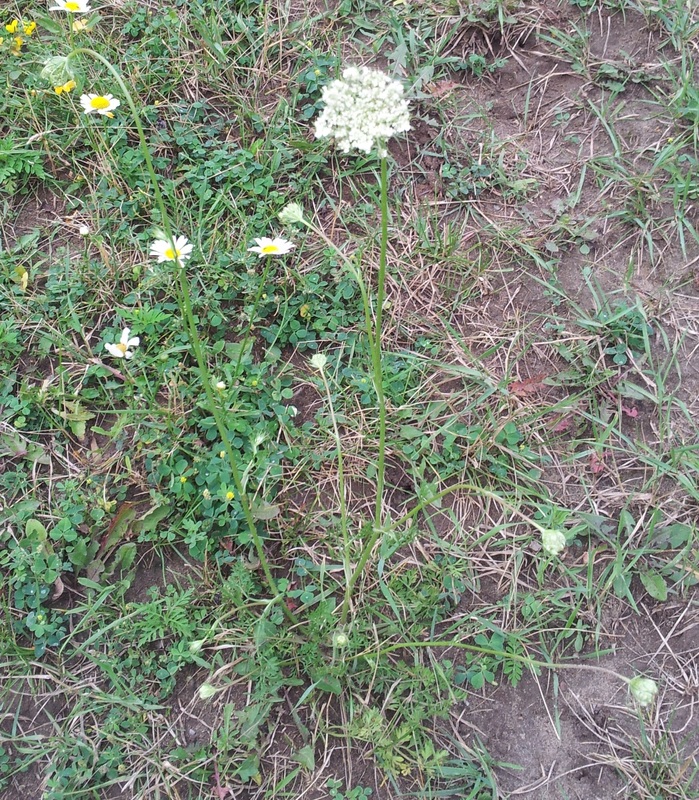 They then proceeded to make a lovely bouquet out of our "lawn". 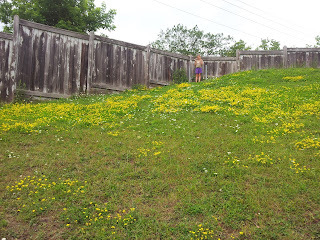 We let the hill in our backyard go pretty natural for a variety of reasons, the most prominent being that it's hard to mow a hill and we have better things to do, but also because I find a monoculture of grass boring and it gets a pretty good mix of random plants and flowers and by doing this it generally stays green and pretty and we get some visitors - bees, butterflies and all the groundhogs named Daisy. I do remove "prickles" for the sake of bare feet and the majority of the dandelions for the sake of my neighbours (OK, maybe only the ones they can see in the front). As I have just returned from a course that involved a lot of plant ID, I'm in a vegetation ID kind of mood. 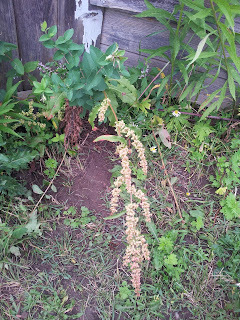 So we went out the other day to figure out just what the heck is growing in our lawn this time of year. If I remember, we'll do this again later and we can see if it's different. I did not take pictures of dandelions, plantain or anything that wasn't flowering yet - so this isn't quite everything that's in there. Come fall there will be asters, goldenrod and maybe some other stuff too. I will note that a lot of this is not native to Ontario - many of these species are "naturalized", meaning they have been here for so long that they are now a part of the ecosystem. Many were introduced from Europe by settlers, either as food or decoration. This should not be confused with "invasive" which is a plant that seriously threatens the balance by taking over. 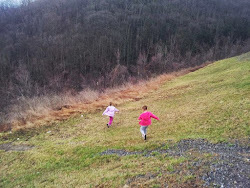 Look - there's a Bunny on the hill! She pointed out that because this blog is called "Beans and Bunny"
that she really should be IN the pictures. 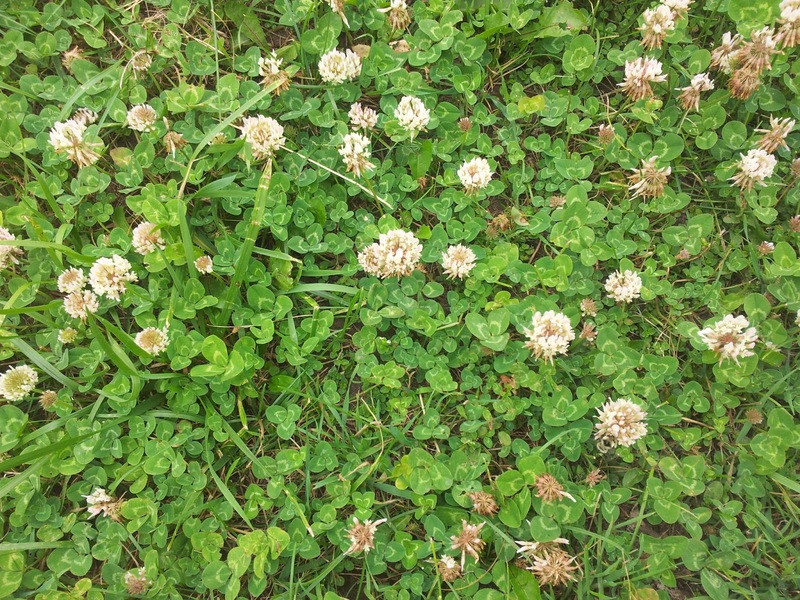 If I was actually trying to grow grass (which I halfheartedly am in the front yard), clover is an awesome plant to have in there because it crowds out weeds and is a nitrogen fixer, so it helps grass grow. 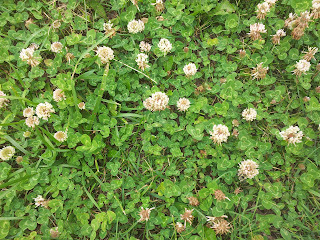 Which is why I dump clover seeds on my front lawn. Also, it's easier to grow than grass (but not as easy as dandelions). Nitrogen is an important part of the whole life-building process, but the plants need some way to get it from the atmosphere to a usable form and that's where the microscopic organisms come in. 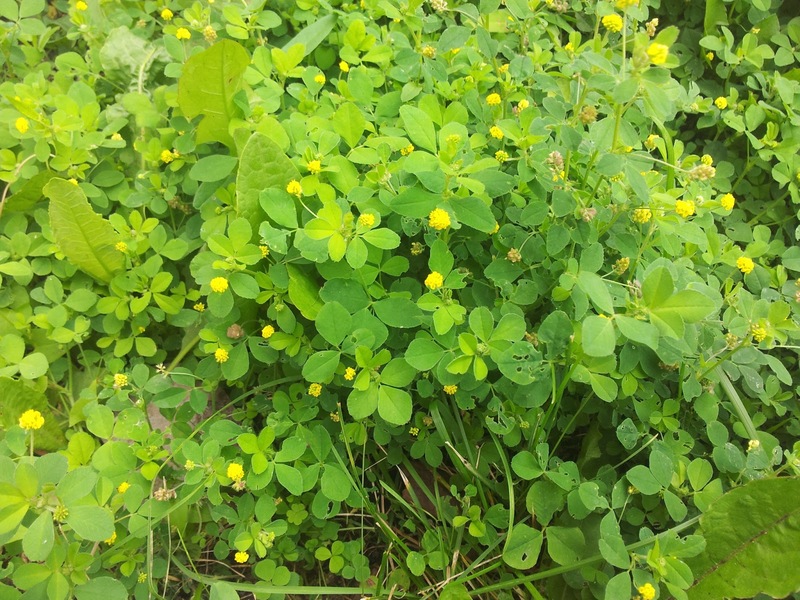 In some plants, in particular a lot of members of the legume family, have formed a symbiotic relationship (win-win) with bacteria call Rhizobia in their root systems. These bacteria make nitrogen into a form that the plant can use, then when the plant dies that usable nitrogen goes into the soil where it is available to other plants who aren't as lucky to have the bacteria hanging out with them. This works so well that many farmers use nitrogen fixers in their crop rotations. SUPER AWESOME COOL FACT: Another nitrogen fixer is lightning - which by extreme heat converts atmospheric nitrogen into nitrogen oxides which are then carried to the earth by rain, where it can be used by plants as nitrates. 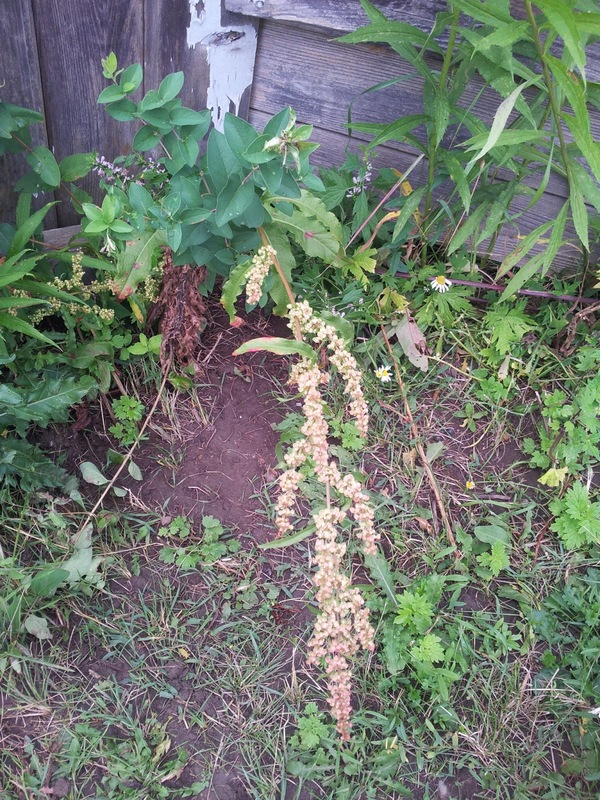 So thunderstorms are actually fertilizing the plants in a small way. See - told you it was a super awesome cool fact. There are a lot of cycles in nature - this one is the Nitrogen Cycle! Now this is one of those ones people usually try to get rid of, but I find it grows well (also a nitrogen fixer) is soft and green and low so it's perfect for rolling on (because that's what you do when you have a hill). Plus it's EVERYWHERE. The little seed pods look like birds feet, hence the name. I love when they name things after what they look like, it results in me having to make up my own names for things a lot less. This is a happy looking little plant, it growns really well, is yet another nitrogen fixer and our resident bumble population just looove it. Bees are fun to name, by the way, and that day we had Bumble, LaBumble and Cabumble (said like an explosion) (Bunny) and their friends Sally, Bob and George (Beans). 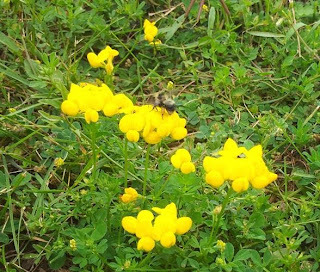 With the recent decline in bees, I'm happy to give them a little safe haven on our hill. OK, OK, it's small, all by it's lonesome and it's not flowering, but maybe it will and maybe we can eat it! I should hope you all know what strawberries are and their awesomeness, so there's not much more to say here. 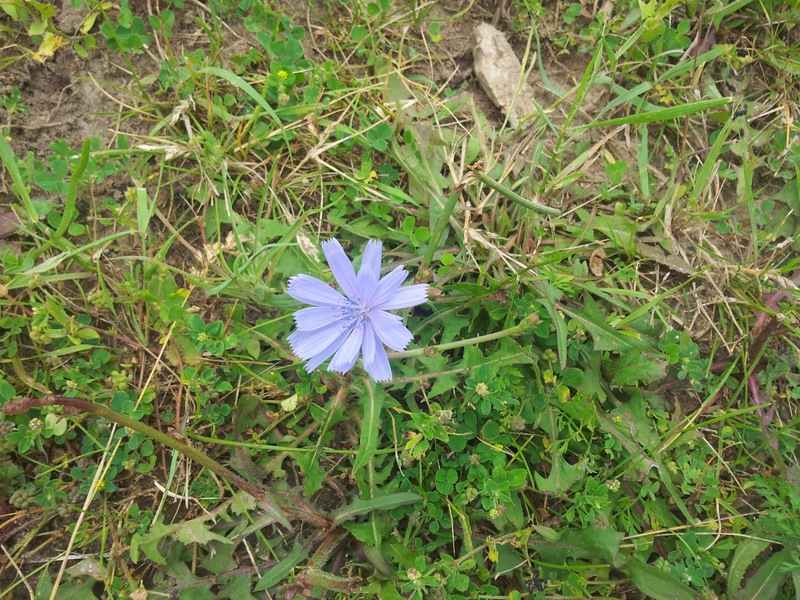 I have always been a bit jealous of this plant as my Grandma re-named it after my sister, so even though I now know it's chicory I always still think of it as "Rachel-Flower" in my head. 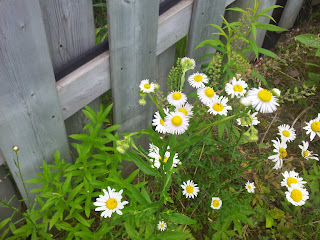 This is a favourite of the groundhogs named Daisy, so we have a few leaves and flowers and a lot of woody sticks. This is a super useful plant if we ever wanted to harvest it - you can eat the leaves (it's the wild cousin of radicchio and endive) and the roots are baked and ground as a coffee substitute. I love daisies. So much so that they were the flowers at our wedding. They don't serve any purpose on the hill other than to make things happy and sunny and pretty, and they do a damn good job of that. Completely unrelated to the sea creatures, by the way. These are pretty and grow really well pretty much everywhere. I transferred a few of them into the garden area of the hill and now I have a ton there because they multiply by underground rhizome. First Nations used this as a treatment for wounds and sores, so it's probably pretty handy to have around. These ones are quite nice to have around! More things that look like dasies, yay! 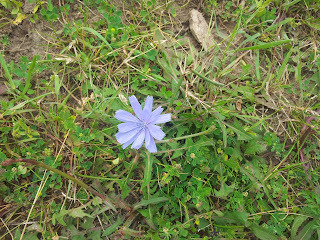 We don't have any deer come round, but if we did they would eat this, which looks rather like an aster, but isn't. Daisy Fleabane (lots of tiny petals) and also some more Oxeye Daisies. If you pull this one out and break the root and take a sniff, it smells just like carrots. Which makes sense because it IS a carrot, but too woody to be edible. It does look lacy though, and there is one tiny red flower in the middle to attract insects (which you can't see on this really because I'm not very good at plant pictures). Super easy to remember name because they are what they say - PINK. 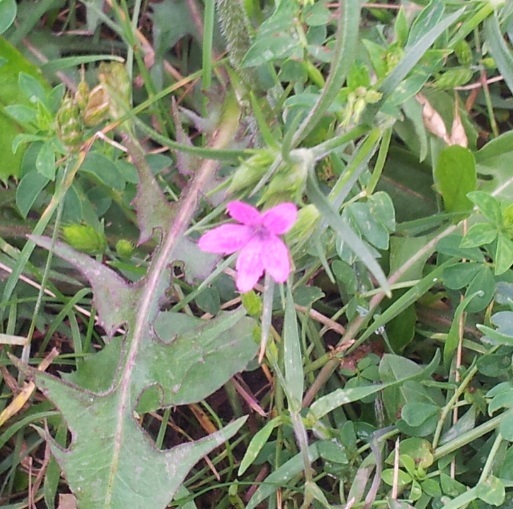 Tiny little guys, we have quite a few of them scattered about. Plus both Beans and Bunny love pink, so they show up in our lawn bouquets a lot. A tiny dot of pink in the "lawn"
This one is really cool. 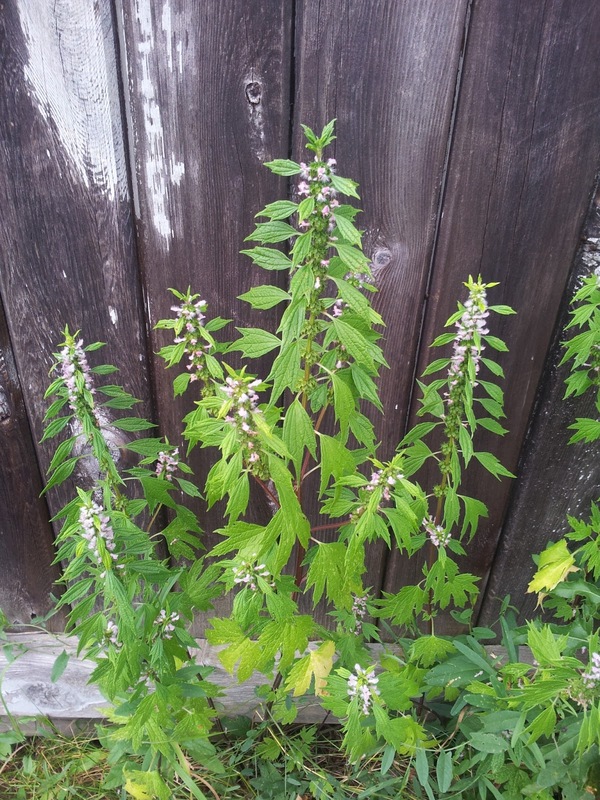 It's a member of the mint family and has a long traditional medicine history. Used mostly for women for a number of reproductive issues (hence the name). 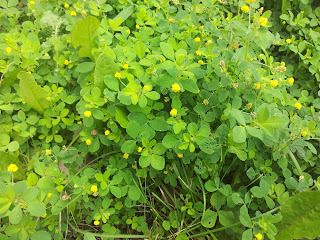 It's also been used for it's calming effect, as a cardiac tonic, for insomnia and also stomach issues. We use it for looking nice against a fence, but it's nice to know that should I need whip up a uterine tonic, it's easy to get. 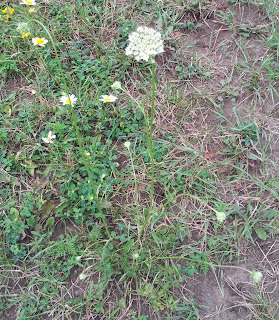 So this is one of those love-hate plants. It can be invasive in some places, however it provides a good winter food source for our bird friends, so as we don't have a lot of it I just let it be. In googling I have discovered that you can grind up the seeds and make flour. This one is falling over it has so many seeds! OK, clearly this isn't a plant. 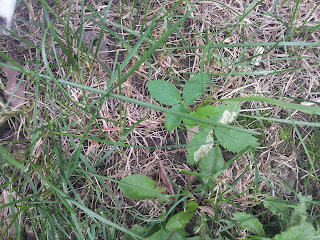 But it's in the lawn and we were quite excited to find it after our decomposition talk the other day. We inspected it and noticed that the flies had moved in and there were tiny maggots on it, so it's probably in stage 3. Bunny won't let me move it as she wants to keep track of the process (such a proud mama-nerd I am right now!) and informed me it would be wasting it to put it in the garbage when I told her that's what people usually do with dead things, and I do not want to be known as a grackle waster. She even invited the neighbour over to poke it with a stick. 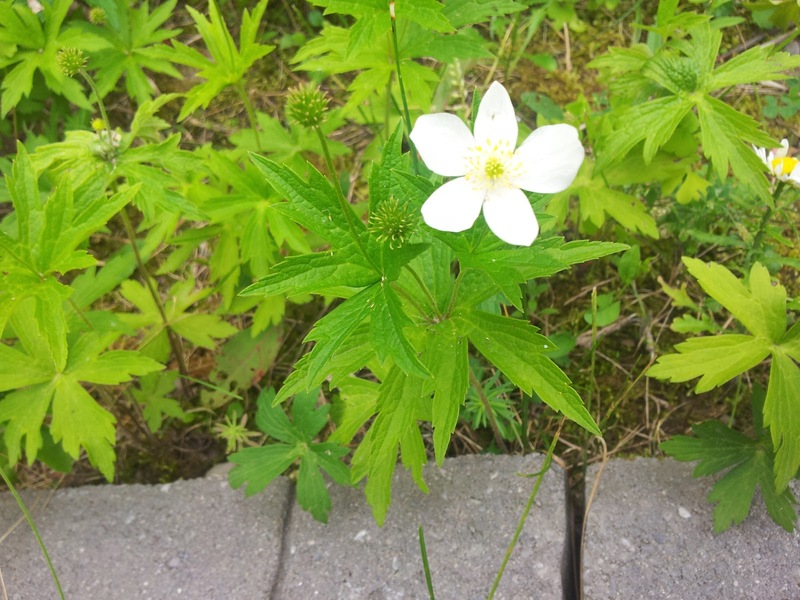 People in our neck of the woods who want to ID their random wildflowers in their lawn -try http://www.ontariowildflowers.com/ for figuring out what you've got. If you want a book I would recommend Newcomb's Wildflower Guide or the Peterson Field Guide for Wildflowers (I have both on the shelf in my office). 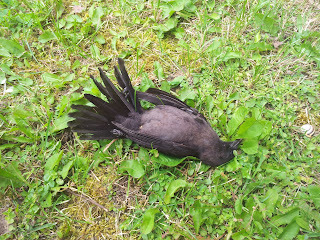 Note: Since writing this we have buried the grackle on the hill as the neighbours dog was rolling on it. That aside... 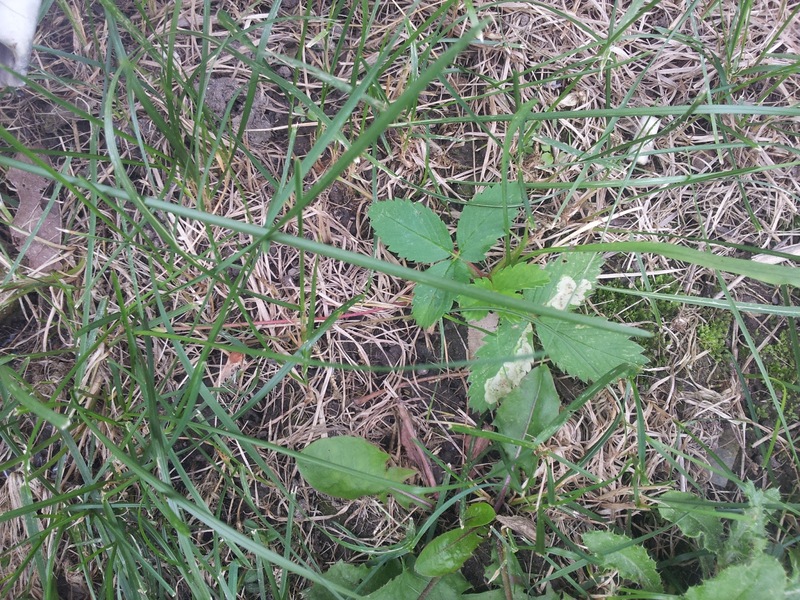 I did not know that lightening is somewhat fertilizing my plants (and weeds). That was very cool to learn. 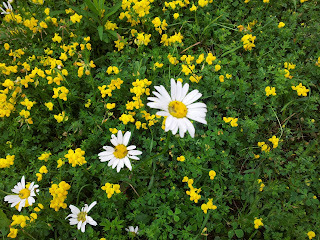 Question for you- I've always heard that daisies are invasive too? Since you like them so much, I thought you'd know the answer. Awesome-great post Kate :) Learned lots.